In the last couple of weeks, in conversations about MOOCs, I’ve found myself making the point that a year ago we didn’t really use the word MOOC, and while the MOOC platforms were getting organised at that point, no Coursera/Udacity courses had even run. So, I thought it might be interesting to take a look at some of the Twitter data to see roughly the shape of the body of tweets mentioning MOOCs in the past 365 days. I’ve not played with Twitter data before, but through some quick Googling, I found a few potential tools to do all the hard work for me – Topsy being the one which I found best to work with, and generated the following brief analysis using it. The sharp drop off at the end of the graph is an artefact of data collection (i.e. January 2013 isn’t finished yet). If we ignore the last data point (January 2013), there was a slight dip in December, but this may have been a result of the holiday season. 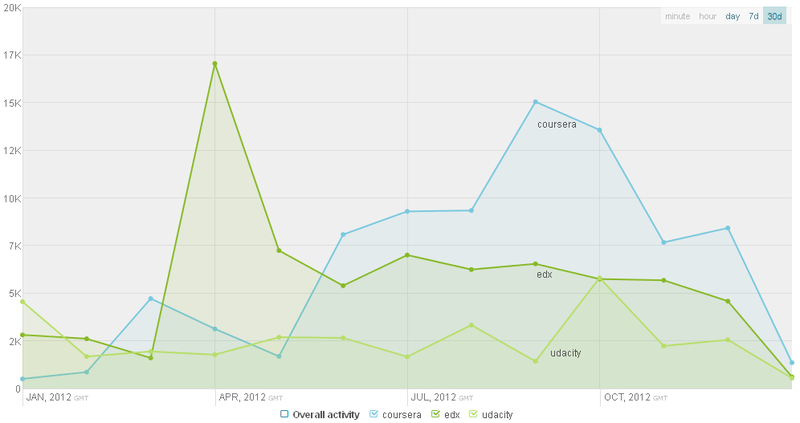 So while 2012 may well have been the ‘year of the MOOC’, I don’t think the bubble has burst yet! Topsy also has sentiment analysis functionality built in, so I couldn’t resist trying it out, although this part comes with a caveat in that I have no idea exactly how the website defines sentiment, so the tool is a bit of a ‘black box’ to me. General sentiment seems to be positive; although negative spikes are rare, they are more pronounced. To create this chart, Topsy processed 83,158 tweets, 10,407 it deemed to be ‘positive’ and 3,538 ‘negative’ in sentiment. It could be interesting to do a deeper analysis like this to explore trends in the discussion topics surrounding MOOCs. I also couldn’t resist having a look to see how the Twitter buzz varies around the three main MOOC platforms. Looking at the tweets from January 2012, the Udacity and Coursera tweets are still at a very early stage; the tweets are focused upon news stories about the platforms being founded. Note that EdX was not even on the horizon at this point – rather, January 2012 tweets appear to relate instead to a DJ called EdX. Anyway – while this has been quite a quick-and-dirty kind of analysis, it sort of captures a bit of the whirlwind and buzz that has surrounded MOOCs in the past year, and the gain in momentum. I wonder where it’ll be this time next year!